This week, we are wrapping up our five senses in kindergarten. What a perfect opportunity to find an inexpensive treat for some science fun! Let me show you how to integrate math, reading, and writing as well all by using Popcorn! I went and bought a new popcorn popper for my kindergartners so that they could utilize all five. Not only can they see the popcorn popping, the can hear it, smell it, then feel it once it cooled down, and then finally taste it! I add a bit of salt to the bowl and we are good to go! 1. First set rules for how far they need to sit away from the popper. They will worry they won't get to see, but to be safe set up a barrier or a table they need to watch from. 2. Once popped and the senses that were reviewed and property words shared, send them back to their spots where you can set out a napkin or paper towel. I give each group a cup of salted popcorn and share that this is what they will get for the five senses activity. 3. I create an anchor chart that we then review with taste being the last one that we do. The words they describe are what I write down. We feel and describe, share what we smelled and describe, share what we see heard (it's hard to say anything, but pop...), and then we taste it! 4. While they are eating, I love popping up Epic Books, free to teachers, and finding The Popcorn Book by Tomie dePaola. I paraphrase for my kinders so they can understand the pictures. 5. When everyone is finished we head to the carpet for our Google Interactive Smartboard game! These slides are the best! I can have students come to the board after rewarding them for making good choices, listening right away, doing their work. I give out Smartboard Sticks with numbers on them. If I have 8 slides I give 8 sticks out and so on. The students one at a time then go up and use the movable pieces to show what they know. It is a great way to assess if they understand the concepts! 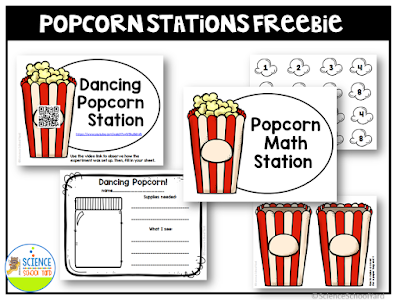 You can find the Popcorn digital activity and Stations HERE. I included a free download for this activity HERE. 7. 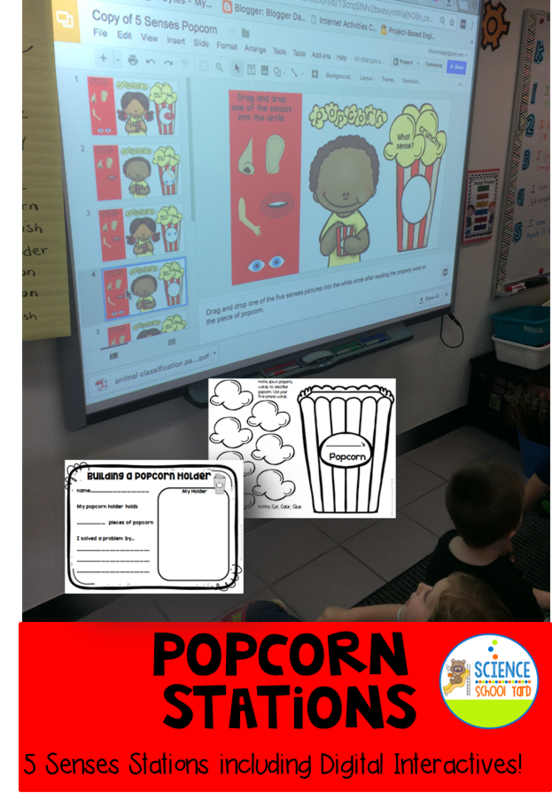 The math activity includes giving each of my students a popcorn bucket pattern or the real things from the Dollar Store. I make the different numbers on popcorn shapes that then go in a popcorn bag or bucket or even just turned around in the middle of the table. 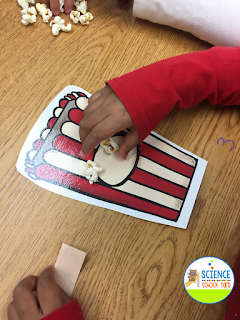 Students then turn two cards over, use real or paper popcorn patterns to count it out. They love this! 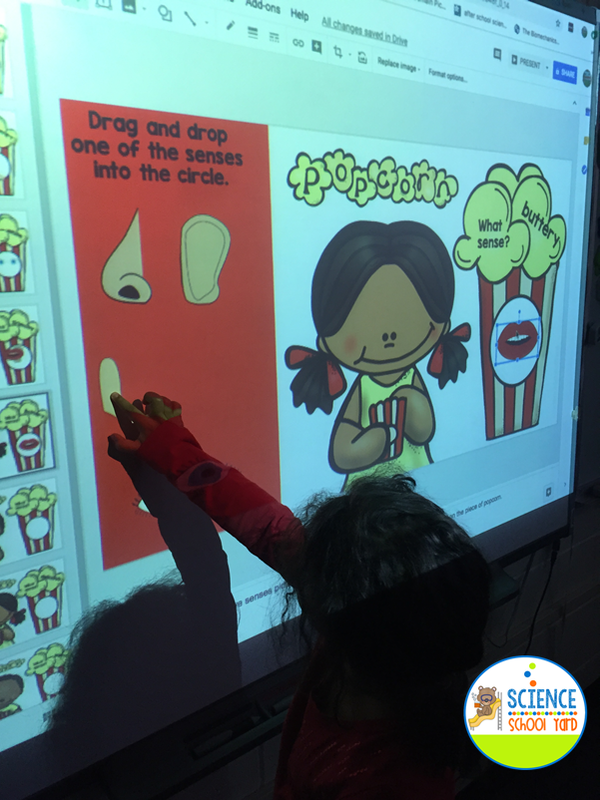 Popcorn and Senses a perfect combination! 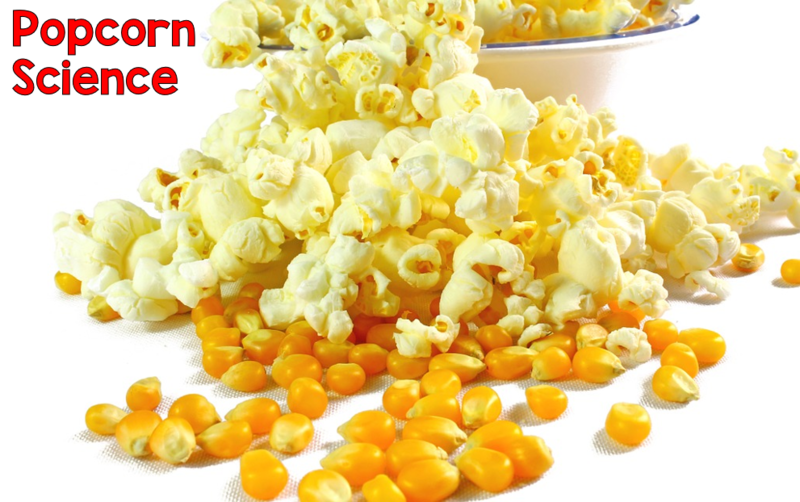 Pop on over to my store for other popcorn fun!